It’s been called “revolutionary” and “disruptive.” By any other metric, technology in senior living today is transforming the way care is delivered. It’s also significantly transforming the quality of life for millions of seniors, and for the better, most say. Consider Selfhelp Community Services, whose nascent days 80 years ago were spent supporting Holocaust survivors seeking refuge in America and today offers a different kind of refuge online through its innovative Selfhelp Virtual Senior Center. The center evolved out of a request by the New York City Department of Aging to develop new kinds of technology-based services to help the area’s elderly cope with isolation. Scott Code worked at the center developing the project before becoming associate director of the Center for Aging Services Technologies at LeadingAge. Seniors use the platform to connect with their other homebound peers. 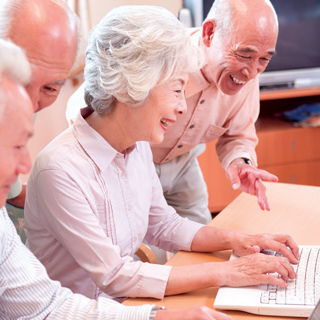 “In essence, using a simplified touch-screen computer and group video chat, you can ‘virtually’ bring homebound or isolated older adults together each day through engaging, volunteer-facilitated, discussion-based classes,” says Code. The results literally changed lives. “It gave them purpose and meaning to their day,” adds Code, noting that the vast majority of participants now feel less hopeless about companionship, less isolated and disconnected from family and friends, and report a better quality of life. “From a resident’s perspective, technology is facilitating entertainment, communications and social connectedness with friends, families and staff; enabling more resident engagement in care planning, self-management, including management of chronic conditions, and community activities; and supporting brain fitness, wellness, safety and independence,” says Majd Alwan, Ph.D., senior vice president of technology for LeadingAge and CAST executive director. So much of technology today flows up and down, left and right through the senior care continuum. Some innovation begins to fill a need among the aging in place community, as Selfhelp’s center did, and later is repurposed and at times improved in established elder living communities, and vice versa. Years ago, before becoming chief operating officer for Affinity Living Group and professor, executive-in-residence and founding director of the Program in Senior Housing Administration at George Mason University, Andrew Carle worked with a team to develop the world’s first wearable elopement technology, with a tracking device embedded inside the sole of a shoe. The so-called GPS Smartsole allows individuals with Alzheimer’s at risk of wandering to be located within three feet, virtually anywhere in the world, and anytime they step outside of a preset Geozone, Carle says. Wearers easily can be checked and located via any internet-connected device or smartphone app. Nothing has transformed senior living more today than the electronic health record. Then there’s mobile tech. Smartphones, tablets and other cellular-connected devices have streamlined care at the bedside and allowed seniors to stay connected with their families and friends in very powerful ways. “Mobile technology is allowing caregivers to do their job wherever they are and spend more time with residents at the same time,” says Charlie Mintz, director of business development for CareServ Technologies LLC. “Caregivers are already using mobile technology to access and document ADLs and care notes, get nurse call alerts, communicate via HIPAA-secure text messaging and make phone calls, all from a single device.” Smartphones, in fact, are allowing many providers to move away from “kiosks,” or wall-mounted or standalone stations, to check and upload information, making them vastly more efficient. Cloud-based computing today has freed senior communities of the shackles and risks of physical servers, exponentially improving the security and seamless, rapid transmission of data. It also allows families and friends to connect with community residents using wireless methods such as cell phone and Wi-Fi. Volumes have been written about the transformative powers of telemedicine, particularly in vast stretches of our rural landscape, and of remote sensors’ ability to prevent falls and elopement. Wearable tech has exploded in senior living, far exceeding even the most hyperbolic estimates when they were introduced a few years ago. Seniors today can wear unobtrusive pendants, bracelets or even passive embedded sensors in clothing to be tracked and located and that upload vital signs and other health data to cloud-based platforms and even EHRs. And as providers grapple with multiplying numbers of caregiver positions and fewer people to fill them, wearable tech promises untold efficiencies. Observers and developers say they’ve only scratched the surface of wearable tech’s benefits. Alan Bugos, head of technology and innovation at Philips Healthcare – Home Monitoring, sees a future in which Wi-Fi and Bluetooth surpass their cellular counterpart as the technologies powering connectivity inside senior living communities. “With secure, reliable Wi-Fi connectivity throughout the entire community, more technology devices are now able to interoperate,” he says.